As a die-hard movie lover, I live for the kind of opening weekends where the only movies hitting theaters are high quality, worth-seeing works of art. In all truth, it's very rare we get a weekend that can be unanimously labeled as one of the best opening weekends of the year with nothing but excellent movies opening. In 2014, this is it, this is that weekend. Where you must find a way—find the money, find the time—to make it to your local cinema to see one of, if not all of, this weekend's new releases. Two of the best films of 2014 open today in America: Richard Linklater's Boyhood and Matt Reeves' Dawn of the Planet of the Apes. And I really, truly mean it when I say they're two of the best of the year - both are innovative, masterful movies. Linklater's Boyhood is the film that he took 12 years to make, using the same actor every year, allowing us to watch a boy (and a girl - his sister) actually grow up for real on screen. I still adore Linklater's Before trilogy as true untouchable masterpieces, but Boyhood is an experience unlike any other. 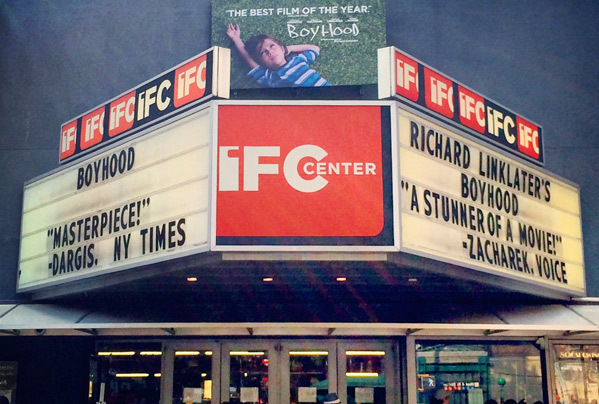 Many critics have called it a masterpiece (see the IFC Center marquee below), and even with 95 reviews recorded, it still has a 100% rating on Rotten Tomatoes. Impressive, but deserving, as it's a film that is near impossible to condemn, especially because it's rather lightweight yet so meaningful and emotional and realistic in its approach to showing what life is really like growing up. If you need any more convincing, read Drew McWeeny's review. Reeves' Dawn of the Planet of the Apes is the sequel to the very successful and better-than-anyone-expected Planet of the Apes reboot from a few years ago, that is actually better than that movie in many ways. It is being referred to by critics as the sequel that Empire Strikes Back was compared to A New Hope. Both are wonderful, but the second kicks things up to another level, and succeeds on that level. Same with this movie - an incredible cinematic creation from a technical standpoint, with a poignant and brutally honest script that positions humanity as the villains who cause all the trouble. It's emotional, entertaining, visceral and breathtaking, everything movies are supposed to be. If you need more convincing, read David Chen's review. What I love about this opening weekend is that I can speak so frankly about both of these movies because I love both of them and have been supporting both of them since very early on. I caught the world premiere of Boyhood at Sundance 2014 earlier this year (read my review here); I caught a very early private screening of Dawn of the Planet of the Apes only a few days after it was finished (read my Sound Off here). Even though they're polar opposites in the cinematic world, they have both left a lasting impression and fond memories. I've already seen both movies twice, and plan to watch them each again in the next few weeks. These are the kind of movies that the entire world will fall in love with, and we can all enjoy wonderful cinema together. To find a list of theaters where Boyhood will be opening throughout the next month, visit their website. Opens in NY & LA first, with more to come. Dawn of the Planet of the Apes is playing in 3D/2D nationwide. So go out this weekend, find the nearest theater showing Boyhood, or Land Ho!, find the biggest screen showing Dawn of the Planet of the Apes, call all your friends, and have a night (or afternoon or morning) at the movies you won't soon forget. You can trust us, and every other critic out there - your money will be well spent, supporting two filmmakers and the talented teams behind them that created these masterpieces of modern cinema. Your support will show Hollywood that audiences do support quality and originality and innovation. It will make a difference, and best of all, you'll catch two of the best movies of 2014 on opening weekend. Both are progressive, masterful films made with deeply caring precision, boundless creativity, and complete honesty. The kind of movies that we all hope to see on the big screen, and fall in love with forever. Enjoy the weekend. Enjoy the summer in all its glory. Enjoy your time at the cinema. Enjoy the movies. Both movies looks very good, and I will see them, eventually.. However, there's only one movie I am going to see this week end, and that's Lawrence of Arabia... In 70mm.. There are 3 showings at he Paramount, in Austin, this week end, and I might go see them all.. Still the greatest movie of all time..
Boyhood is only out in two cities, but I will be trekking out next weekend when it opens in Dallas. So excited for both these films. I can totally read your enthusiasm in this article. Thank AB. You da man!! !